■Candles were introduced into Japan during the Nara period (710~). Beeswax candles are said to have initially come from China along with Buddhism. 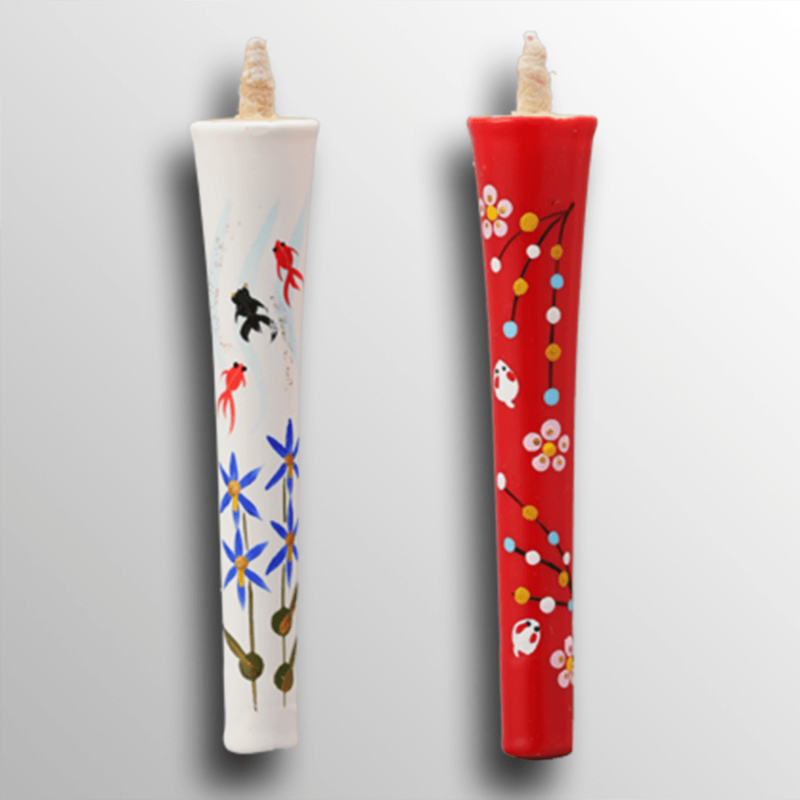 From the Muromachi period, people began creating modern style Japanese candles made from wax trees, and usage of this style of Japanese candle peaked during the time from the late Edo period through to the Meiji period. 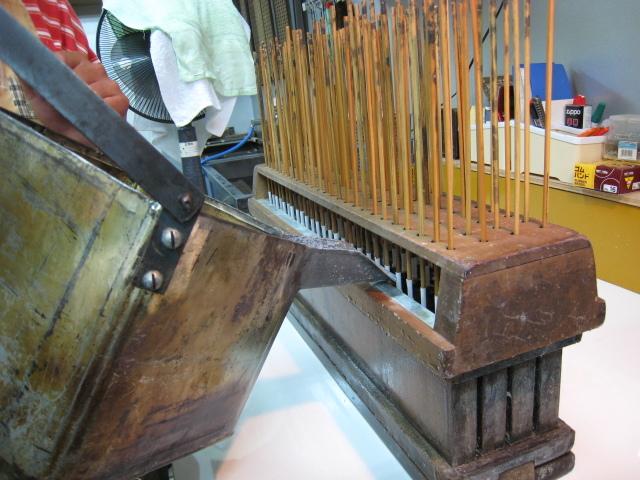 However, production of Japanese candles has been placed in a difficult situation due to western candles and the rapid proliferation of electricity reducing the need for candles themselves and following the total destruction of wax trees in Nagasaki, the main production area, by the eruption of Mt. Unzen Fugen-dake (1991). 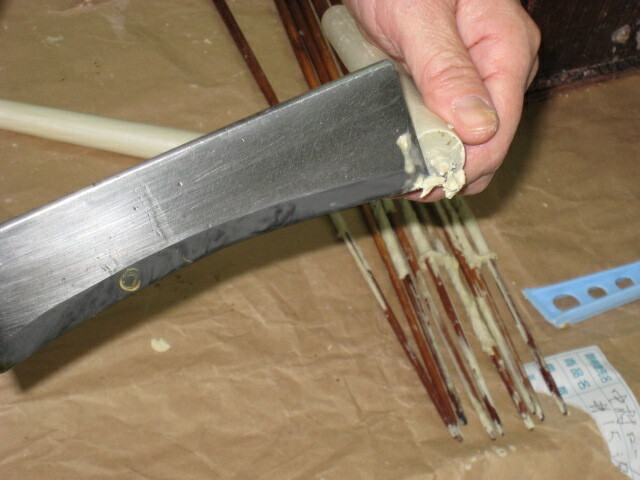 Wicks, the cores of which have been wrapped in grass, are inserted into bamboo skewers. 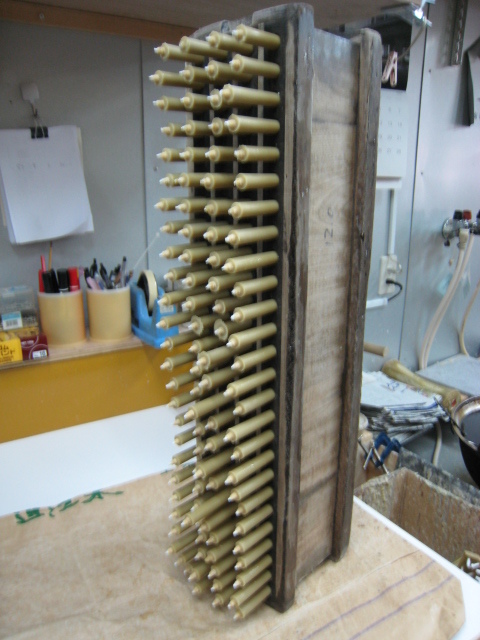 ②Place wicks in wooden molds. They are warmed in moderately hot water to prevent hardening the wax poured in in the next step due to temperature differences. 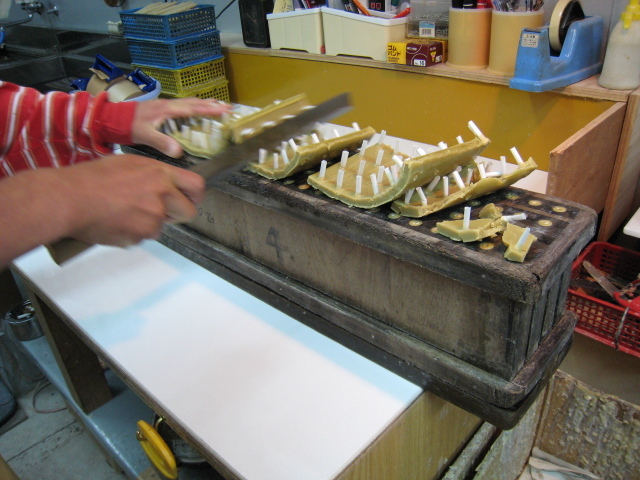 ③Pour wax into the wooden molds. 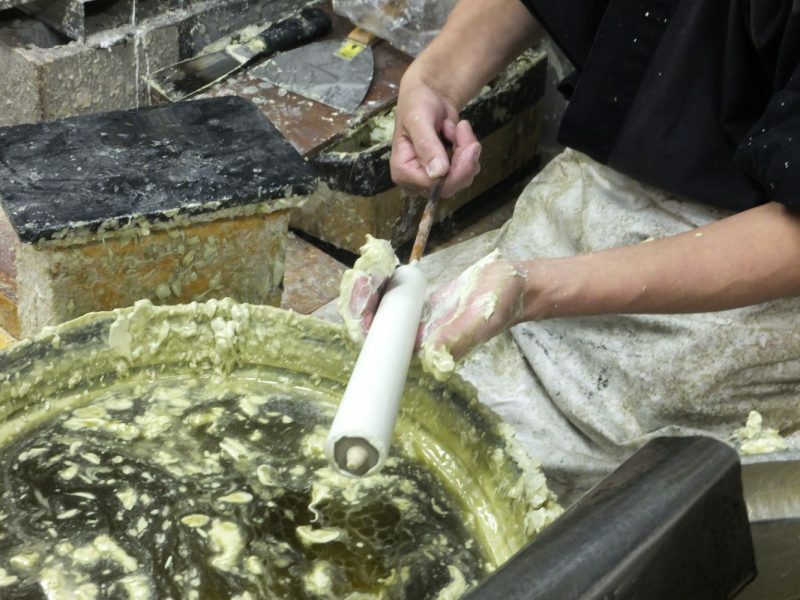 Wax is poured into the wooden molds containing the wicks. The candle materials, formed by pouring in tree and vegetable wax, are removed. ⑤Apply finishing coats of wax. Well-kneaded finishing wax is rubbed on the materials by hand as they are exposed to sunlight to keep them at a moderate temperature. *Vermillion colored candles are coated with vermillion colored wax. Shapes are adjusted by removing any excess finishing wax stuck to the upper portion of the candle around the wick and to the bottom. ⑦When making picture candles, the artist then draws on a pattern. 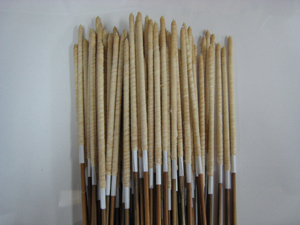 ■As they are made of pure vegetable matter, they produce little smoke and give off the faint scent of melted wax. The wax liquefies when the candle is lit, but the liquid is absorbed into the wick and evaporates along with the flame, so there is very little dripping. 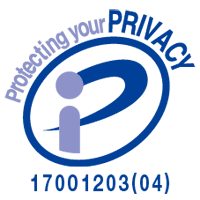 Also, as there is little soot produced, it can easily be wiped away even when dirty. 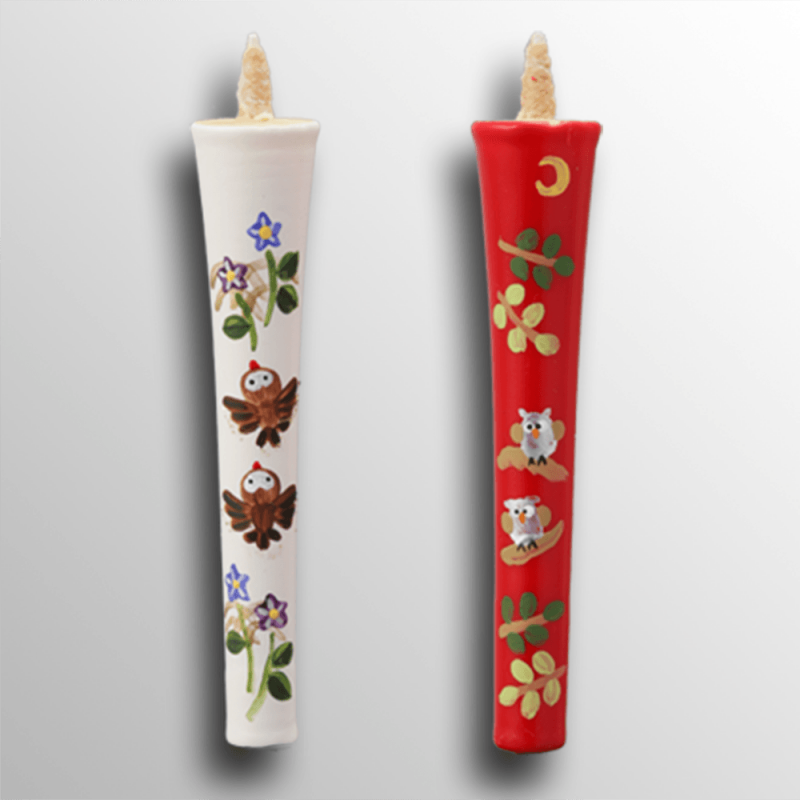 ■The flame from a Japanese candle is immediately recognizable as different from a western candle. The large and swaying flame of a Japanese candle has a mystique and atmosphere that gives the impression of having a mind of its own. 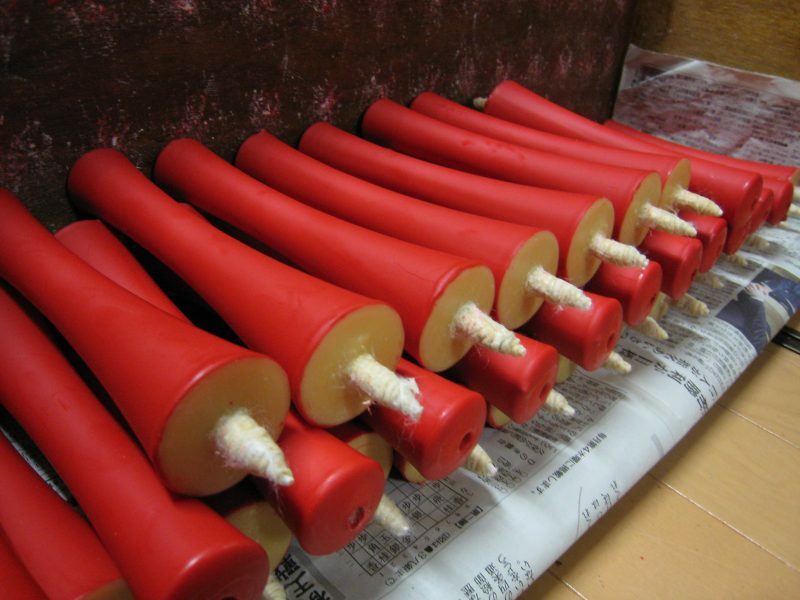 The secret behind this difference lies in how Japanese candles are constructed. 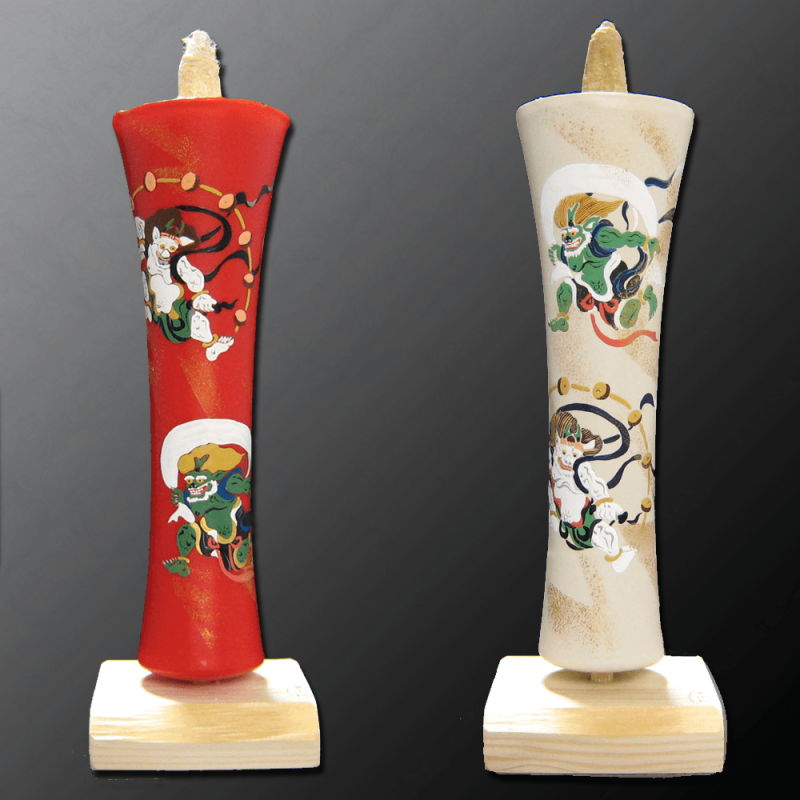 Japanese candles have hollow cores, and air flowing into the candle causes the flame to sway. ■The reason wax trees are the perfect material for making Japanese candles is because they give off little vapor and are all-natural, so they are not harmful to people. Wax trees are also cherished as the raw ingredient for Japanese candles because, while simultaneously being highly resistant to wind, the way the flame sways even in the absence of wind is mysterious and profound. *”1/f Fluctuation” refers to fluctuations in power (spectral density) inversely proportional to the F frequency. ■As the wick in a Japanese candle burns over time, the flame grows much larger as the wick blackens and carbonizes but remains in place. *Please use a dedicated candle wick trimmer. ■After using a Japanese candle, placing the candle stand in warm water will melt the wax, so the candle stand remains clean without scrubbing, which could damage it. ■Animal or petroleum based candle soot can only be removed using cleansers, but soot from Japanese candles can be wiped off.